You are currently browsing the tag archive for the ‘The Walking Dead’ tag. I have not had a great history with Stephen King. His books tend to leave me cold, sometimes even bored, which is fatal for a horror suspense novel. Yet for my entire life he has been lauded as this amazing storyteller, whereas generally he leaves me nonplussed (and I am pleased to see I am not alone on this score – although the Nostalgia Critic irritates some people as much as King does myself, so a mixed result there). Still I persist in reading King, because there has to be some reason for his success and the affection he inspires in many readers. Here’s the thing – I like a lot of the movies and Frank Darabont in particular has proven to be a wonderful collaborator. Apparently he has even convinced the writer to submit scripts for The Walking Dead television series, which should prove interesting. The story opens with husband and father David Drayton narrating to us the events of July 19th, when an unusual storm hit the community of Bridgton, Maine (of course!). With his house damaged and the family in need of supplies, Drayton takes his son Billy, as well as neighbour Brent Norton with whom he has endured long-standing acrimony, to the town centre to buy supplies. At the local supermarket Drayton encounters the rest of the cast, including store employee Ollie Weeks, the elderly town gossip Mrs Carmody and an attractive out-of-towner Amanda Dunfries. Feeling an unusual premonition, Drayton has an urge to drop everything and rush home to his wife Stephanie. Then a fog bank swoops down over the town, similar to the one Drayton saw nearby his own home earlier that morning, eerily still and white. 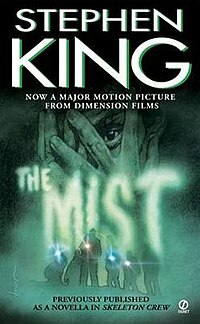 A man bursts into the supermarket yelling about things moving about inside the fog, claiming that he heard people screaming. Some customers grab what they can, infuriating the store manager when they do not pay, and run outside to get home. The rest are swayed by talk of something unusual happening in the mist and trust to the safety of the supermarket. The cause of the unusual phenomenon is never explained, but when night falls the supermarket is falls under siege by a multitude of horrifying, insect-like creatures and tentacled monstrosities. The people within manage to mount a basic defense against the invasion, but it becomes clear that should one of the larger entities outside attack the store they will all be killed. The strain mounts, with some committing suicide and others turning for comfort to Mrs Carmody, transformed into a prophet of doom by the event, demanding a human sacrifice to appease the creatures. Drayton attempts to plot an escape with other sympathetic folks, but the dangers inside and out of the store increase with each passing night. I was surprised with how much I enjoyed this story. For one, given that I already knew most of the plot from Darabont’s film adaptation, it was pleasing to still be surprised by some of the tricks King pulls here. It is a tight, fast-paced yarn, which owes a lot to traditional suspense stories, where for the most part the nature of the eldritch threat outside the supermarket is left to the reader’s imagination. I think the main reason I enjoyed the story was because it is far less bloated than other King books I have read. He excels as a writer of shorts, too overly fond of extraneous detail in his longer novels. I suspect the reason for this is the evident influence of more visual horror tales, such as EC Comics and the films of his youth. As a horror writer he carries with him a precursor to the OCD-like insistence on jump-cut gore that today’s fiction demonstrates. Consider the modern game Dead Space – whose film adaptation I reviewed here – which sets out to be a traditional spine-chiller, but is just as twitch-happy and insistent in its gore as any brain-dead horror yarn. When King sticks to the shorts, he’s far more convincing.